Dr. Christopher Yuan has taught the Bible at Moody Bible Institute for over ten years and his speaking ministry on faith and sexuality has reached five continents. Christopher graduated from Moody Bible Institute in 2005, Wheaton College Graduate School in 2007 with a Master of Arts in Biblical Exegesis and received his doctorate of ministry in 2014 from Bethel Seminary. Dr. Christopher Yuan is a passionate speaker, delivering life-changing messages to audiences young and old. Communicated with raw honesty, his journey from tragedy to triumph has moved and warmed countless hearts. But it is the combination of his authentic life experiences and a sound exegetical and theological underpinning that sets him apart, making him a unique and much-needed voice for such a time as this. 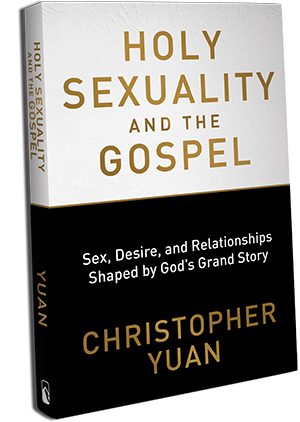 Dr. Christopher Yuan explores the concept of holy sexuality - chastity in singleness or faithfulness in marriage - in a practical and relevant manner, equipping readers with an accessible yet robust theology of sexuality. Whether you want to share Christ with a loved one who identifies as gay or you’re wrestling with questions of identity yourself, this book will help you better understand sexuality in light of God’s grand story and realize that holy sexuality is actually good news for all. Dr. Christopher Yuan, always accompanied by one or both of his parents, travels the globe as a bearer of Christ proclaiming the good news of the redemptive power and unwavering love of Jesus. View his online itinerary to see when he’ll be in a city near you! Dr. Yuan is a Christian speaker and author on faith and sexuality, and a professor at Moody Bible Institute.